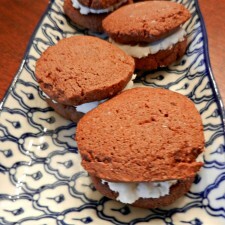 If you tuned in on www.ilovethepromise.com this Tuesday morning then you probably heard Theresa and I talking about the chocolate mint sandwich cookies I brought in for the show. They were pretty delicious. I am a huge fan of the chocolate mint flavor combination and ever since I made the Coco-mocha cookies for Easter I’ve been wanting to re-create the recipe as a sandwich cookie with a mint filling. When I made my last batch of cookies I doubled the recipe and then froze the dough in a log for future use. I love doing this because It saves so much time when you’re ready to bake again and slice and bake dough yields wonderfully uniform cookies. If you decide to freeze the dough it is a great idea to write the important recipe details on the dough itself- that way if it is a while before you bake again you have the information you need there with the dough. When you are ready to bake just take the dough out of the freezer and allow it to thaw at room temperature for about an hour or place it in the refrigerator for up to 24 hours and it will be much easier to slice (be sure to unwrap it BEFORE you slice it ). This dough is a wonderful recipe because it isn’t only packed with rich chocolaty flavor… it is also more healthy because it is made with coconut oil and whole wheat flour. After you’ve baked a batch of the cookies allow them to cool for about 5 minutes on their pan then move them to a cooling rack. While they cool whip up a batch of the yummy minty filling. In a large bowl combine all ingredients and beat on low speed until combined, increase speed to medium and beat an additional minute until slightly fluffy. Smear about a tablespoon of the filling on the back of one cookie. Top with another cookie to create a sandwich. P.S. Remember to tune in to Daytime on NBC tomorrow to see Erin make another great Mother’s Day gift, homemade truffles! Check your local listings for show times.